Medieval coin: cut halfpenny of Henry III (1216-1272) minted in London between 1248 and 1250. Probably Class 3a. North Nos. 986. Obverse description: Bust facing forwards. Reverse description: Long-voided cross with three pellets in each quarter. 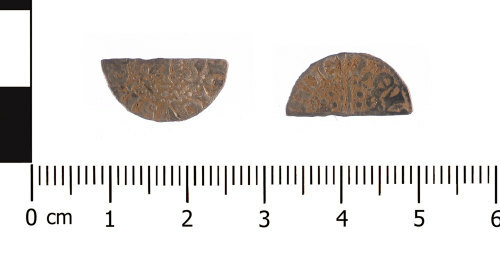 Medieval coin: cut halfpenny of Henry III (1216-1272) minted in possibly London between 1248 and 1250. Class 3a-c. North Nos. 986-988. Medieval coin: cut farthing of Henry III (1216-1272) minted in possibly London between 1248 and 1250. Class 3a-c. North Nos. 986-988. Medieval coin: cut halfpenny of Henry III (1216-1272) minted in Newcastle by Jon between 1248 and 1250 AD. Class 3: North Nos. 986/988.